It’s so nice to have a soak in a hot-tub on a chilly winter’s morning, and even better when the hot pool’s big enough for the girls to swim! 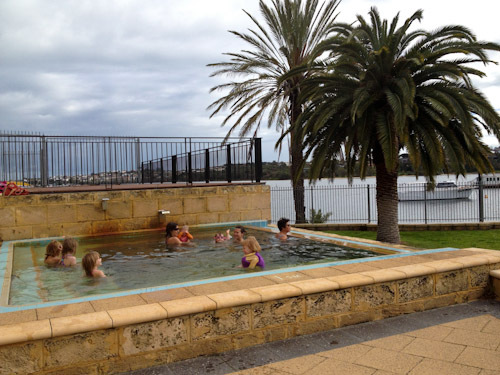 We first heard whispers about a geothermal hot pool in Perth months ago and today visited the natural artesian mineral pool that sits on the banks of the Swan River in Bicton. I love hanging on the edge of the hot pool and daydreaming as I watch the river. Of all the hot springs we've visited, this may be the geothermal pool with the best view! The Melville Water Polo Club has two pools in its small council-owned complex on the river. The pools were originally heated through a heat-exchange system that used the hot waste-water from a sugar-mill located across the river. When the sugar-mill closed down, a bore was drilled and now the naturally-heated water is pumped to the surface and used in a complicated set of brass pipes in the side of the main pool that transfers the heat to the salt water. Another line deposits the mineral water directly into the thermal pool. The main pool was purpose-built for water polo in 1979. At one corner of the complex, the mineral pool provides a relaxing soak at temperatures between 35-41°C. When Cam turns the water on to raise the pool's temperature, it circulates through the pool and out two spouts that massage whoever is sitting below them. 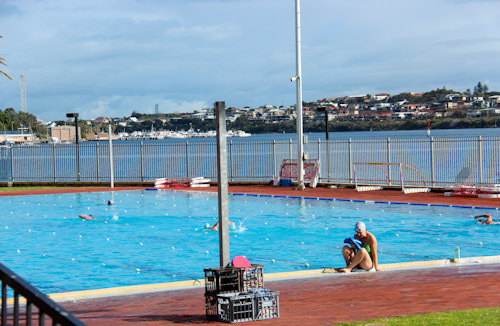 If you’re visiting the Bicton baths in Melville, there are a couple of places to park — on the end Durdham Crescent, off Phillips Street or at the southernmost end of Blackwall Reach Parade. 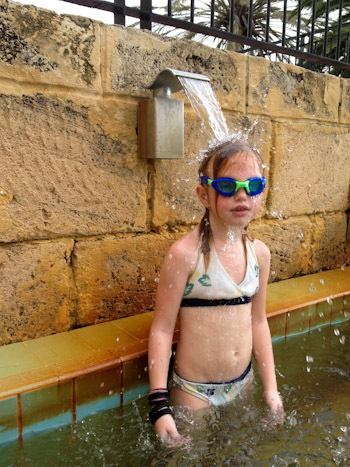 A friend and her daughter cycled along the river to serendipitously join us in the hot pool. 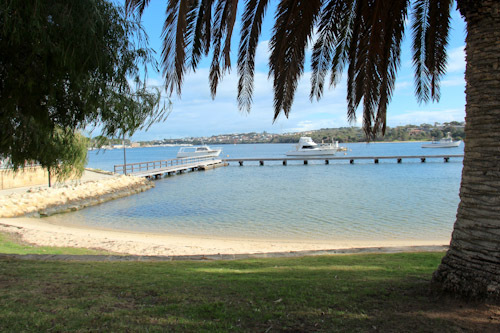 There's a pretty beach on the Swan River just next to the Melville Water Polo Club. It looks like a fantastic place to cool off in summer. I’m glad we finally got to experience the hot pools in Perth! 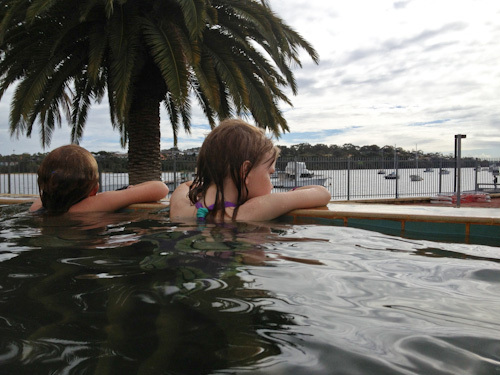 The girls are keen to keep swimming as much as they can, and discovering a hidden gem like the Bicton Baths makes our outing all the more exciting. Looks amazing! I love thermal pools! Looking forward to being able to hop into one again after bubba is born! I, like Chloe, have lived here my whole life and never heard of them either. Looking forward to trying them out now I know they exist. Thanks. Thanks Lauren for sharing, I must take the kids there!